227 Beacon is located on the south side of Beacon, between Clarendon and Dartmouth, with 225 Beacon to the east and 229 Beacon to the west. 227 Beacon was built in 1868-1869 for building contractor George Wheatland, Jr., for speculative sale, one of four contiguous houses (223-225-227-229 Beacon) designed as a symmetrical group. 223 Beacon and 229 Beacon are on 19.5 foot lots and have double oriel windows (to which a third, smaller extension has been added at 229 Beacon), and 225 Beacon and 227 Beacon are on 18 foot lots and have single oriel windows. Click here for an index to the deeds for 227 Beacon. On May 14, 1869, 227 Beacon was purchased from George Wheatland, Jr., by Melancthon Woolsey Borland. He and his wife, Julia (Gibson) Borland, made it their home. His brother and sister-in-law, John Nelson Borland, and Madeline (Gibson) Borland, lived next door at 229 Beacon. Julia and Madeline Borland were sisters. In 1876, they traveled to Europe, where they lived for several years. During the 1877-1878 and 1878-1879 winter seasons, 227 Beacon was the home of Frank Merriam and his wife, Teresa (Lovering) Merriam. They had married in September of 1877 and 227 Beacon probably was their first home together. Frank Merriam was a property agent and trustee of estates. They built a new home at 183 Commonwealth and had moved there by the 1879-1880 season. The Borlands were once again living at 227 Beacon by the 1879-1880 winter season. They continued to live there in 1882, but moved soon thereafter. He continued to own the house and lease it to others. By the 1882-1883 winter season, 227 Beacon was the home of Dudley Bowditch Fay and his wife, Katherine (Gray) Fay. He had graduated from Harvard in 1881 and they had married in October of 1882; 227 Beacon probably was their first home together. He was a trustee and would become a noted expert on ancient Greek and Roman coins. They continued to live at 227 Beacon during the 1887-1888 season, but moved thereafter to 287 Beacon. On June 4, 1888, 227 Beacon was purchased from M. Woolsey Borland (at that time a resident of Waterford, Connecticut) by Anna B. Homer and her sister, Margaret Homer. They were the daughters of Peter Thacher Homer and Caroline (Bunker) Homer, both of whom had died in 1887. Prior to their parents’ deaths, Anna and Margaret Homer had lived with them at 27 Mt. Vernon. Margaret Homer married in June of 1891 to Charles Davis, Jr., and 227 Beacon became their home. He previously had lived at 28 Blagden. On July 2, 1891, Margaret (Homer) Davis acquired her sister’s interest in 227 Beacon. Charles Davis was treasurer of the Atlantic Dyewood Company. During the 1892-1893 winter season, the Davises were living elsewhere and 227 Beacon was the home of merchant Benjamin Loring Young and his wife, Charlotte (Hubbard) Young. They had lived at 3 Fairfield during the previous season. They also maintained a home in Weston. By the 1893-1894 winter season, the Youngs had moved to 357 Beacon and 227 Beacon was once again the Davises’ home. They continued to live there in 1900. During the 1900-1901 and 1901-1902 winter seasons, the Davises were living elsewhere and 227 Beacon was again the home Benjamin and Charlotte Young. 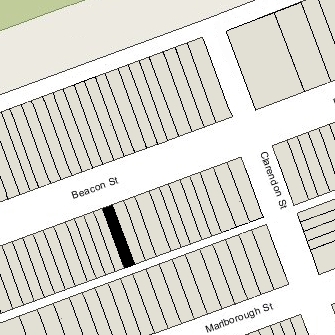 By that time, the Youngs owned and lived at 285 Beacon but moved to 227 Beacon while Charles and Mary (Hersey) Vose lived temporarily at their home. By the 1902-1903 season, the Youngs had moved from 227 Beacon and by the next season were once again living at 285 Beacon. The Davises resumed living at 227 Beacon during the 1902-1903 and 1903-1904 seasons, but then moved to the Hotel Victoria at 273 Dartmouth. In 1909, they purchased and moved to 273 Beacon. On June 21, 1904, 227 Beacon was purchased from Margaret Davis by Dr. Ernest Amory Codman. He and his wife, Katharine Putnam (Bowditch) Codman, made it their home. They previously had lived at 104 Mt. Vernon. They also maintained a home in Ponkapoag, Massachusetts. Ernest Codman was a physician and surgeon. An advocate of hospital reform, he sought to establish an “end results” system to track the outcome of patient treatment and identify and make public any errors, with the objective of improving the quality of care. After his approach was rejected by Massachusetts General Hospital in 1914, he established a private hospital on Pinckney Street where he implemented his methodology. The Codmans leased office space and lodgings to other physicians. Also listed in the Blue Books and/or City Directories at 227 Beacon were Dr. Beth Vincent (from 1905 through 1908), Dr. George Cheever Shattuck (from 1909 through 1912), Dr. George W. Morse (in 1911), Dr. Alice Hamilton (in 1925), and Dr. Roy E. Mabrey (from 1937 through 1945, and possibly later). Ernest Codman died in November of 1940. 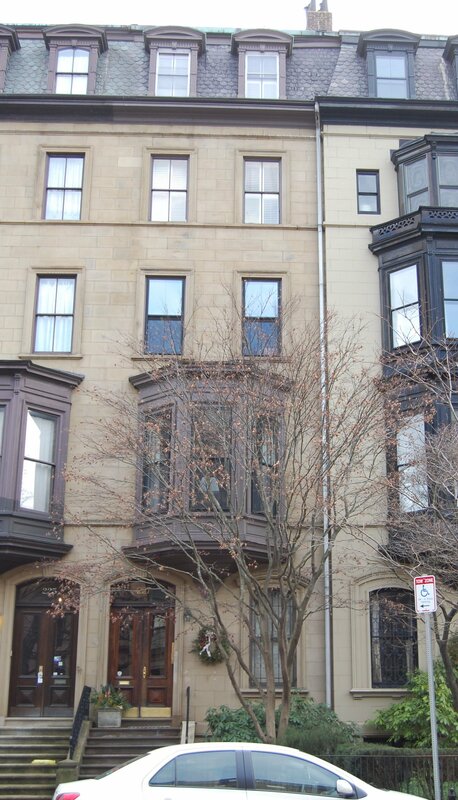 Katharine Codman continued to live at 227 Beacon until her death in March of 1961. On August 18, 1961, 227 Beacon was acquired from Katharine Codman’s estate by Dr. Leo J. Reyna and his wife, Priscilla Deane (Trick) Reyna. He was a professor of psychology at Boston University and considered the founder of the field of behavior therapy. They continued to live at 227 Beacon in 1967. On July 1, 1969, 227 Beacon was purchased from the Reynas by Richard Schanzle and his wife, Gwenda Jessie (Carney) Schanzle. He was an executive with a leather company and later a real estate dealer. In September of 1969, the Schanzles applied for (and subsequently received) permission to construct a garage at the rear of the property. They continued to live at 227 Beacon until the late 1970s. On January 25, 1979, 227 Beacon was purchased from the Schanzles by Dr. Marcia Scott. In May of 1979, she applied for (and subsequently received) permission to convert the property from a single-family dwelling with garage to four apartments and garage. In June of 1993, she applied for (and subsequently received) permission to reduce the number of apartments from four to three. 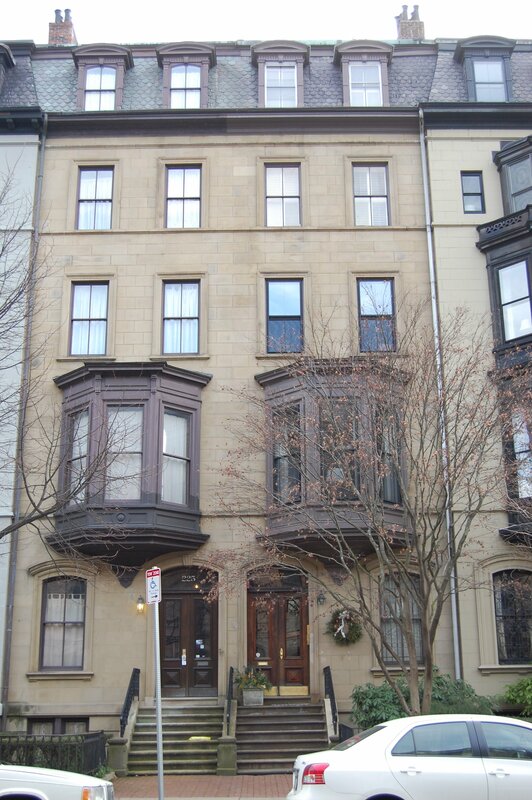 On July 30, 1993, she converted the property into three condominium units, the 227 Beacon Street Condominium.